posted by Lisa Ace in Making Crosses, lent, art, religion. We are invited to a journey of exploration and prayer during Lent using Ellen Morris Prewitt’s book Making Crosses: A Creative Connection to God. Lent is an intentional time to journey with Jesus to the cross by adding intentional prayer practices to our daily lives. Making crosses out of discarded items will be a great way to add spiritual awareness to your life. This active prayer form will help you open your life to God’s healing, love, and challenge in a new way. posted by Lisa Ace in Making Crosses, art, lent, religion. posted by Lisa Ace in Making Crosses, lent, religion. posted by Virginia Kropf in Gregory Van Dussen, books, news, religion. After a lifelong career in ministry, Gregory Van Dussen has written his first book, "Transfiguration and Hope." As a new retiree, the vision became clear, he said. One thing which makes his book distinctive, he said, is in his research he read a wide range of authors, not only Christian authors from Protestant to Catholic but Eastern Orthodox, Coptic Orthodox writers from Egypt and Armenian Apostolic. His book is a conversation across time and space, he said. He describes it as gathering many of those voices from the panorama of Scripture and church history and finding in them the common theme of radical transformation in Christ. Van Dussen is a retired United Methodist pastor, having started 39 years ago in Batavia. From 1972 to 1974, he served as district superintendent. His career includes serving at churches in Bergen, Albion, Batavia, East Aurora and Springville. His book is available at the Holland Land Office Museum, on Amazon and in local retail distributors, including the Book Shoppe in Medina, where he has a book signing scheduled from 11 a.m. to 1 p.m. Saturday, Dec. 22. Van Dussen is already working on a second book of devotions, based on the lives of early circuit riders in North America. He hopes to have the new book available by next fall. posted by Billie Owens in EverPresent Church, batavia, news, Announcements, religion. EverPresent Church invites you to visit our new location at 4 Batavia City Centre, Batavia. We are excited to announce our Grand Opening Weekend on May 18-20 at the former Homestead Center also former home to Roxy’s Music Store. EverPresent Church was founded in 2013 in the local YMCA. Not long after its beginning the church found a new home at 8 City Centre, formerly Center Stage Dance Co. Although EverPresent Church embraced its new location, we still longed for a space we could call home. The conversation started back in 2015 with the owner of The Homestead Center but a deal wasn’t stuck until the summer of 2017. Since our move into our new location we have been very busy settling in and making it our own. We are excited to be holding services and If you are looking for a warm friendly environment with a caring community of believers this just might be the place for you. We are a family oriented church with great vision for you and our community. We are excited to see what God has in store for our church and anticipate great things for the future of Batavia. If you are looking for a church and it’s been difficult to find where you fit or feel comfortable, this is the place for you! We are Real People, living Real Lives, with a Real Hope! We invite you to check it out and celebrate together as we help one another on this journey called life. Friday, May 18th at 5:45 p.m. -- MOVIE NIGHT showing “THE GREATEST SHOWMAN." Free popcorn and water; pop available to purchase. Saturday, May 19th -- OPEN HOUSE from 2 to 5 p.m. Come by and check out the place, get some info about the church, and meet the pastors. Sunday, May 20 -- SUNDAY SERVICE at 10:30 a.m. Join us for a time of worship and an encouraging message. ​We guarantee that you will experience God and His love through the people at EverPresent Church. We look forward to meeting you! "Real People. Real Life. Real Hope!" posted by Howard B. Owens in Hope Center of Le Roy, Le Roy, news, religion. It's the vision of Rev. Henry Moore and the team at the Hope Center of Le Roy that the new ministry 42 Main St. will provide the community with a place of hope and help. "We just want to show God's love through all of us and everything that we're doing," Moore said. "That's a lot of what we're based on, the fact of God's love and things will take shape from there." The Hope Center, which is still just barely furnished, offers several programs for the community already. There is L.I.F.T., which stands for Ladies in Faith Together. It's a program for single moms, where single moms can meet and support each other, share a meal, and grow in faith together. The King's Table provides support for caregivers of children with special needs. "A couple of ladies who have special needs children took it upon themselves to start the program," Moore said. "Since then they've begun to bring families in and it gives them an opportunity to just meet together." Fresh Start Literacy is a program for children to get extra help with reading. "We really feel like this is going to be a powerful one because so many families have children who struggle to read," Moore said. "It's tough in a school atmosphere to get one-on-one help. We're willing to offer that." Moms United in Prayer is a chance for women to pray together on a regular basis for children and schools. Annually, the center offers Go Pro Spa Day and the Prom Dress Give Away. Planned programs include Celebrate Recovery, a disaster relief program, children and teens programs and a New Life Clothing Center. Much of Moore's ministry is based on the work, including the Prom Dress Give Away, he was doing with the Living Waters Church. The Hope Center is now a separate nonprofit, and Moore is seeking donation and community support. The Hope Center has also started a building fund with the hope of eventually owning its own building. "What we really want to do is get the community involved get all the churches to come together," Moore said. "I mean, no one person has a vision to make everything happen. One of the things we found was that someone has a vision and they don't know how to make it happen. We want to help that." The rest of the leadership team includes Donna Friedman, Pat Bedford and Amy Bolton. The motto of the Hope Center is that "hope is more than a wish. It is a confident expectation." Moore said it's his goal to see the new ministry provide that kind of confident expectation to the Le Roy community. posted by Howard B. Owens in religion, news, music, entertainment, austin park, batavia. Austin Park was filled with praise and worship this weekend for the Here and Now Festival, featuring several Christian music acts and pastors along with dozens of vendors and activities for families. More than 3,000 people turned out for last night's music and the festival continues today through 10 p.m.
posted by Howard B. Owens in Great Tabernacle Ministries, religion, batavia, news. Great Tabernacle Ministries announces the second annual “Here and Now Festival” to be held Aug. 25-26 at Austin Park in Downtown Batavia. This year has grown to include more than 55 vendors and 12 food trucks from the surrounding region, and more than 14 artists and activities for children including face painting, balloon animals, cotton candy, Kona ice, and more! Music genres vary from '70s rock and folk to rap and hard rock. Friday night features Elevation Worship with an expected draw of people from as far as Ohio, Pennsylvania, New York, New Jersey, Vermont, and Ontario, Calif. There could be up to 4,ooo people visiting Batavia from all around because of this event. Saturday will start at 11 a.m. running all day till 10 p.m. with a number of artist and speakers, ending with runner-up from last year’s hit TV show “The Voice,” Christian Cuevas. Great Tabernacle Ministries would like to thank the Genesee area Businesses, churches, and ministries for all of their support in sponsoring this great event! Without you this event wouldn’t be possible and FREE to our community! That’s right admission is free so mark your calendars now. Photo: File photo. For more photos from last year's event, click here. posted by Howard B. Owens in Batavia's Great Tabernacle, batavia, genesee county fairgrounds, religion, news. Jericka, lead singer for the local Christian band Salt of Earth, sings during the opening of Batavia's Great Tabernacle, a three-day event of music and worship at the Genesee County Fairgrounds. The event continues tonight with free performances by Jim Drew and Jason Upton, and with speakers each night, tonight is Pastor Kevin Traux. Last night's guest speaker was Tim Bennett, and Robin Mark performed. posted by Raymond Coniglio in Le Roy, living waters church, religion, news. Mikayla Radecki, 17, of Holland, speaks with Living Waters Church member Denise Parmenter during the “Girls Helping Girls” prom dress giveaway Saturday at the Le Roy church. Some dreams came true this weekend at Le Roy’s Living Waters Church. The occasion was “Girls Helping Girls,” a prom dress giveaway that marked its sixth year on Saturday. A steady stream of girls and parents browsed among racks of dresses displayed in the church sanctuary. It had a department-store feel. But the beat of Christian rock music was a reminder that the program is a church ministry born out of compassion. “Girls Helping Girls” was originally suggested by church member Valerie Moore. She saw it as a way to help families who may not be able to afford a new prom dress, which can cost as much as $400 on average and is usually worn only once. In the first year, there were about 75 prom dresses available. On Saturday the number topped 600 — more dresses, organizers pointed out, than at Kohl’s, JCPenney and Macy’s combined. Most of the dresses were donated, while others were bought on sale by Moore at the end of last year’s prom season. Although dresses were free, some families have asked to make financial contributions. This year, the church will forward any donations to the House of Hope being built in Moshi, Tanzania, as a refuge for girls who would otherwise be exploited. “Girls Helping Girls” draws families from across the region. One visitor was Mikayla Radecki, 17, of Holland, Erie County, who both made a donation and chose a dress for her upcoming junior-senior prom. Moore has received similar feedback from many girls and families over the years. “A lot of them are very grateful, and very thankful that we do this,” she said. Valerie and her husband Henry Moore have been members of Living Waters Church for 12 years, and help oversee its ministry programs. One of them is Operation Drumstick, which sends church members to New York City. There, they help serve Thanksgiving Dinners to more than 5,000 people as part of an outreach program of the New York School of Urban Ministry. Living Waters is also preparing to send a team to Tanzania to support House of Hope. Closer to home, Living Waters offers dinners and picnics for residents of local apartment complexes. “Our biggest goal is outreach ministry,” Henry Moore said. “People think about missions as, ‘I have to go to another country,’ but ‘missions’ is in our own communities; it’s in our own back streets. “Girls Helping Girls” was originally suggested by Living Waters Church member Valerie Moore, right, who helps oversee mission programs with her husband Henry Moore. posted by Daniel Crofts in religion, St.James Episcopal, authors. It is a bestselling book. It is a “template for religious dialogue,” according to one of the authors. It is required reading in high school and college religion classes. It is a scandal to some, and an inspiration to others. Last but not least, it was adapted and performed as a play by folks in a Florida retirement community. The phenomenon in question is the book titled “The Faith Club: A Muslim, a Christian, a Jew – Three Women Search for Understanding,” by Suzanne Oliver, Ranya Idliby and Priscilla Warner. Oliver came to St. James Episcopal Church in Batavia Saturday to discuss the book, answer questions, and sign copies of the book at a reception afterward. An Episcopalian Christian herself, Oliver attends a church of the same name in New York City. “Except we have an apostrophe after the ‘s,’ ” she said, eliciting laughter from her audience. Her visit was part of St. James’ bicentennial celebration, which will include other events as well. This is what Oliver, Idliby (a Muslim) and Warner (a Jew) tried to do with their book, which was first published in 2006. Oliver sees this as part of a nationwide movement to foster interreligious dialogue and understanding in the face of much fear and violence associated with religion. One reason she feels this is especially important and timely is the increasing number of non-Christian immigrants to the United States. According to Oliver, the genesis of the project came in the wake of the terrorist attacks of September 11, 2001. Prior to meeting Idliby, Oliver believed Islam was a violent religion that mistreated women. But she was surprised by Idliby’s personal independence and her ability to read the Koran (Islam’s principle religious text) and see connections with Judaism and Christianity. It was Idliby who conceived the idea of teaming up with a Christian mother and a Jewish mother to write a children’s book consisting of a miracle story from each of the three Abrahamic religions – Judaism, Christianity, and Islam. Through a Jewish friend, Oliver met and recruited Warner, whom she described as “open-minded and curious enough” to join the project. But when they pitched the idea to an agent, the agent wasn’t interested. Instead, she was interested in the relationship these three women had forged among themselves in trying to write what had seemed like a simple children’s book. How they handled their disagreements (some of them major), found common ground, and continued to work together despite tensions and differences were to become the “stuff” of their joint project. And this is what they have done. With more than 200,000 copies sold, “The Faith Club” has reached many people throughout the country and garnered much praise. In fact, that was the topic of her thesis at Union Theological Seminary in New York City, where she earned a master of arts in Interfaith Theology and Ecumenical Studies in 2012. For more information on "The Faith Club," visit the book's Amazon page. posted by Howard B. Owens in batavia, religion, St. James Episcopal Church. St. James Episcopal Church celebrated 200 years in Batavia today with a special service highlighted by musical performances and officiated by Bishop William Franklin of the Western New York Diocese and former interim pastor Allen Farabbe. The Genesee Chorale, conducted by Ric Jones, also performed, with accompaniment by pianist Doug Henson. posted by Traci Turner in batavia, religion, The City Church, Erin Kelly. 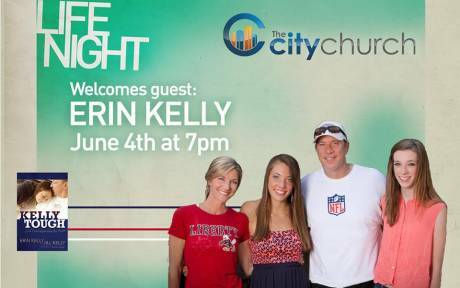 The Batavia City Church will host guest speaker Erin Kelly, oldest daughter of Buffalo Bill's former quarterback Jim and his wife, Jill, as part of their Life Night Service. The service will take place at 7 p.m. on Thursday, June 4. The church's band will start the service and then Erin will share thoughts and personal experiences from her latest book "Kelly Tough." A question and answer session will follow. The book is a story of love between a father and his daughter. In her book, she emphasizes how her faith in God and ability to find strength in weakness helped her to withstand the challenges of her father's and brother's illnesses. Marty Macdonald, senior pastor at The City Church, talked with Jill Kelly's brother, Jack Wagner, to set up having Kelly speak at The City Church. According to Macdonald, the church loves what the Kelly family stands for and everyone is looking forward to hearing her story of family love and the greater love of the heavenly Father. "I hope it will really bring people home," Macdonald said. "There are so many people in our society that are facing challenges whether it's cancer or broken homes or loss of employment, so many things that bring pain and hurt to people. Our hope is that as Erin is sharing her story it will bring great encouragement and hope to let them know that, hey, you can make it. You can go on another day and you don't have to give up." The City Church regularly invites guest speakers to share their stories at their weekly Life Night Service. The church will welcome their next guest, Pastor Tommy Reid, for their Sunday morning service at 8:30 a.m. on June 7. Photo from The City Church's Facebook page. posted by Billie Owens in Announcements, religion, first presbyterian church. Wednesday, May 20, 2015 at 7 p.m.
Come and listen to internationally acclaimed scholar, teacher, retreat leader, author and poet John Philip Newell challenge us to explore a new beginning for Christianity. In the midst of dramatic changes in Western Christianity he offers the hope of a fresh stirring of the Spirit among us. Speaking directly to the heart of Christians – those within the well-defined bounds of Christian practice and those on the disenchanted edges – as well as to the faithful and seekers of other traditions, he invites us to be part of a new holy birth of sacred living. For many years now Rev. Dr. Newell has been writing about the sacredness of being, the “of-Godness” that is at the heart of our lives and all life. He is the former Warden of Iona Abbey in the Western Isles of Scotland and internationally acclaimed for his work in the field of Celtic spirituality, having authored more than 15 books, including his best-known titles, "Listening for the Heartbeat of God," "Praying with the Earth," and "A New Harmony: The Spirit, the Earth & the Human Soul." Rev. Dr. Newell’s talk will be based on his most recent publication, "The Rebirthing of God: Christianity’s Struggle for New Beginnings." Books will be available for sale and following his talk, John Philip will be signing books. A freewill offering will be taken. Simply click on this event as it scrolls across the home page. You will be asked to register for the event and instructed to print a ticket. Questions? Call the church office at 585-343-0505.